For a dog, paying attention to their handler can be challenging, especially if there lots of distractions in the environment. The Pennsylvania Farm Show is coming up on January 7-14 (food court opens January 6), and many of our dogs in training will attend. It’s a great training experience! However, between the crowds, the delicious food, and all the animals, it can be hard for puppy raisers to keep their dog’s attention. Here are five tips to help you set your puppy up for a successful outing. One way is to make sure you have power treats, really good power treats. You might even want to go beyond hot dogs, especially if hot dogs are your typical power treat. Think chicken or leftover steak. 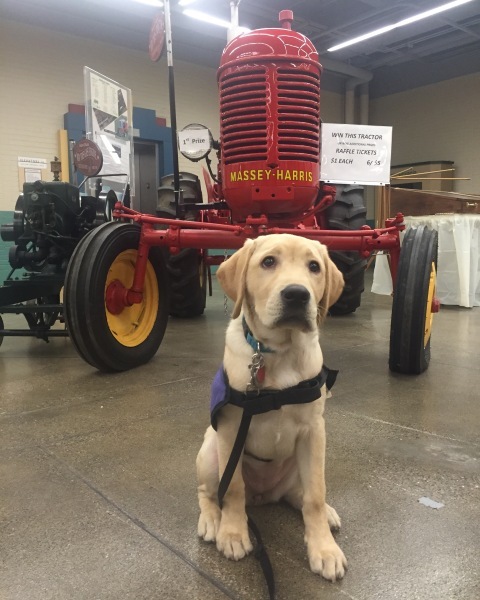 If you’re planning to spend hours at the Farm Show, you may not want to bring your puppy in training with you. Set your dog up for success by planning a short outing. If your dog is doing great, you can consider staying a little longer, but try to leave while your dog is still being successful. There’s a lot to see and do at the Farm Show, so having a plan can help you set your dog up for success. Check out the schedule of events and pick out a few things you think your dog will be able to handle. If your dog does well, you can always check out other exhibits. Make sure you also have plan in case your dog is having a challenging time and you need to leave, especially if you’re attending with friends and family. Make sure you know your dog’s stress signals. By recognizing the early signs of stress and then removing your dog from the stressor, you can help your dog have a more successful outing. For example, if you’re walking near the cows and your dog starts to yawn, scratch, pant, or shake themselves, they might be telling you they’re stressed. 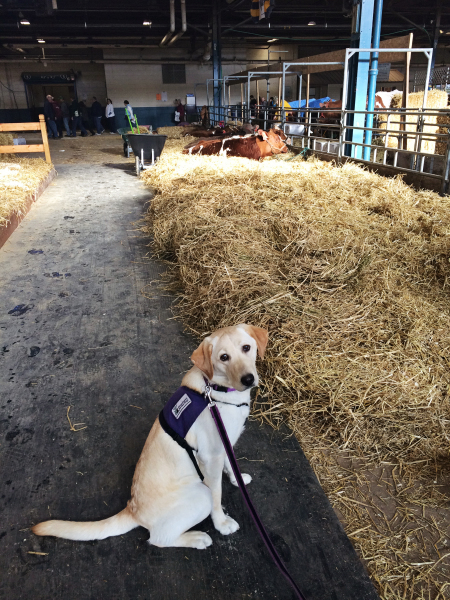 Move your dog away from the cows (or whatever the stressor is) and find a quiet corner where your dog can relax. If you need to, take your dog outside and give them a sniff break. If your dog becomes too stressed, leave the Farm Show entirely. Don’t forget to pay attention to the other end of the leash, too! If you become stressed, your dog will pick up on it, and it will affect their behavior. The Farm Show is a difficult outing! Cues that your dog knows perfectly at home will suddenly become very challenging at the Farm Show. For example, your dog may have mastered “go on through” and walk perfectly through doorways at home and out in the general public, but at the Farm Show, you may have to use a lure to get your dog to walk through a doorway correctly. That’s okay! You may also find that you need to click and treat much more frequently to keep your dog walking with a nice loose leash. That’s okay, too! You’re helping your dog be successful. If you’re taken a service dog in training to the Farm Show before, what other tips do you have? The holidays can be a time of joy and family gatherings, but they can also be filled with danger and anxiety for your dogs. Here are 7 tips to help you make the holidays fun for your dog as well. Live and artificial trees provide wonderful opportunities to practice the cue “leave it” with your dog! Pine needles, ornaments, tinsel, and lights all pose a hazard if chewed or swallowed. You may want to put treasured or delicate ornaments at the top of the tree. Even if your dog ignores the tree and decorations, their tail can still knock ornaments off the tree, potentially breaking them. 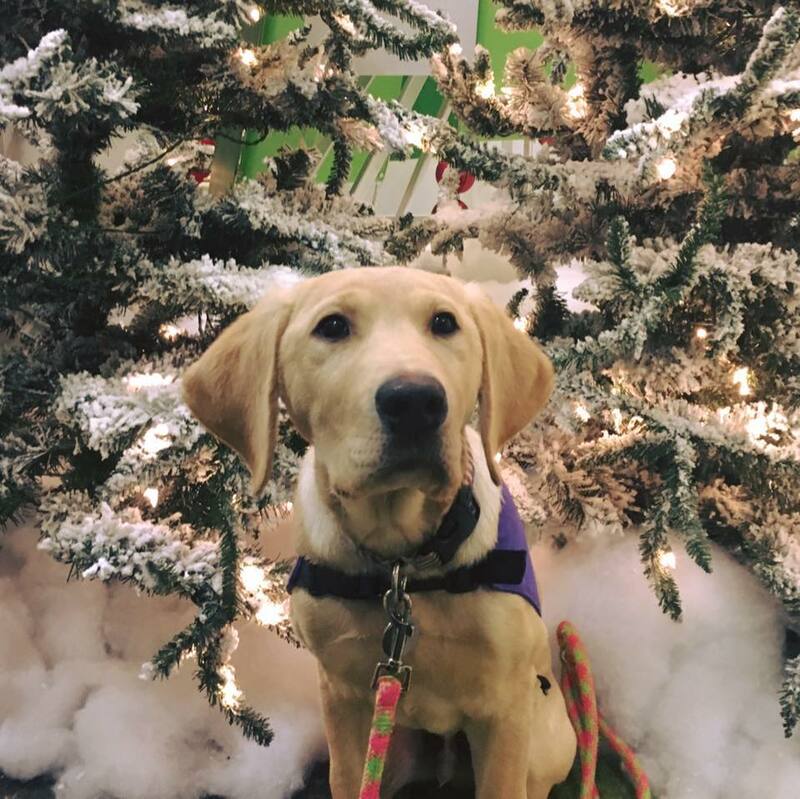 If your puppy persists in investigating the tree, you may want to consider surrounding your tree with an X-pen to prevent your puppy from getting near it. Set your puppy up for success! Tis the season for baking! Many of us bake cookies and other treats during this time of year. All those delicious cookies are tempting for both humans and dogs! This is another good opportunity to practice good house manners and the cue “leave it.” Keep cookies and baked goods away from the edge of the counter or table, especially if they’re made with chocolate, which is toxic for dogs. This is also a good opportunity to practice the cue “go to bed.” Asking your dog to lay on a dog bed or blanket while you’re baking or decorating cookies will keep them safe and out of the way. We often eat lots of special foods at the holidays that we only enjoy once a year, and it’s tempting to want to include your dog by getting them some special treats, too. However, your dog’s stomach could become upset if they aren’t used to eating those treats. It’s a good idea to limit the number of new treats you give your dog. If you’re lighting candles this holiday season, keep them out of reach of your dog. You don’t want your dog to eat the wax or burn themselves. And don’t forget about wagging tails! 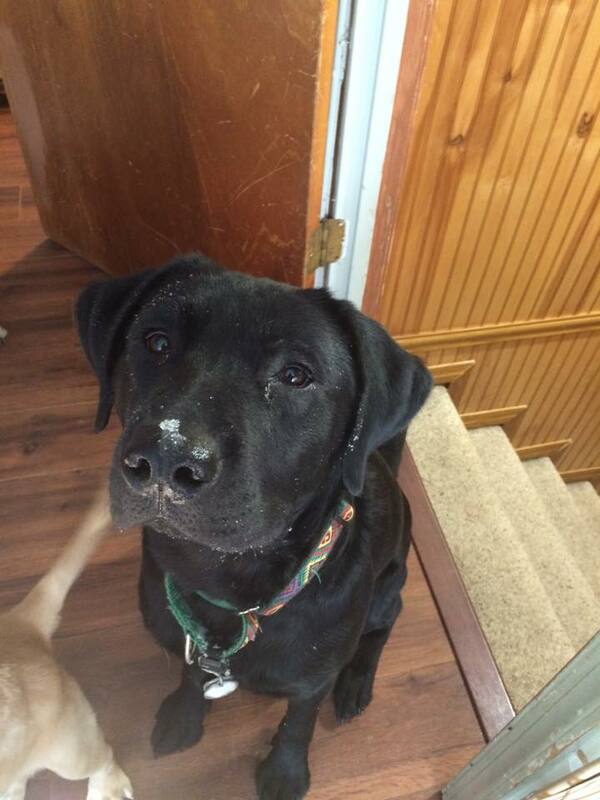 Lab tails have been known to clear coffee tables. Thanks to a wagging tail, your candle could end up on the floor or worse, your dog or house could catch on fire. It’s exciting when friends and family visit for the holidays! This is a perfect opportunity to practice good greetings with your dog. Don’t wait until the day of your event to practice. Start now. Practice polite behavior—keeping all four paws on the floor, no barking, self-control—when you knock on the door and ring the doorbell. Ask a friend to help you and your dog practice. And if your dog is just going to get too excited, crate them while your guests are arriving. You can let your dog out once the excitement of new people has subsided. Also, make sure your guests understand proper greeting behavior with your puppy in training. Let your guests know they can help your puppy learn good behavior by completely ignoring them if they jump or bark. If you’re entertaining guests, it’s very easy for your dog to slip out the door when people are coming and going. You also never know if a well-meaning guest will let your dog out to potty, not knowing whether your dog needs to be leashed outside. Make sure your dog is wearing their collar and tags so if they do get out, it’s easier to recover them. If you have an SSD dog, it’s a good idea to add a tag with your contact information, too. All the extra activity and excitement of the holidays can be exhausting for your dog. Give them a safe place to relax. This can be their crate or a dog bed set up in a quiet spot. Make sure your guests understand that they need to respect your dog’s need for space. Happy holidays to you and your dogs! Fifty of our service dogs in training now know how to fly on a plane! 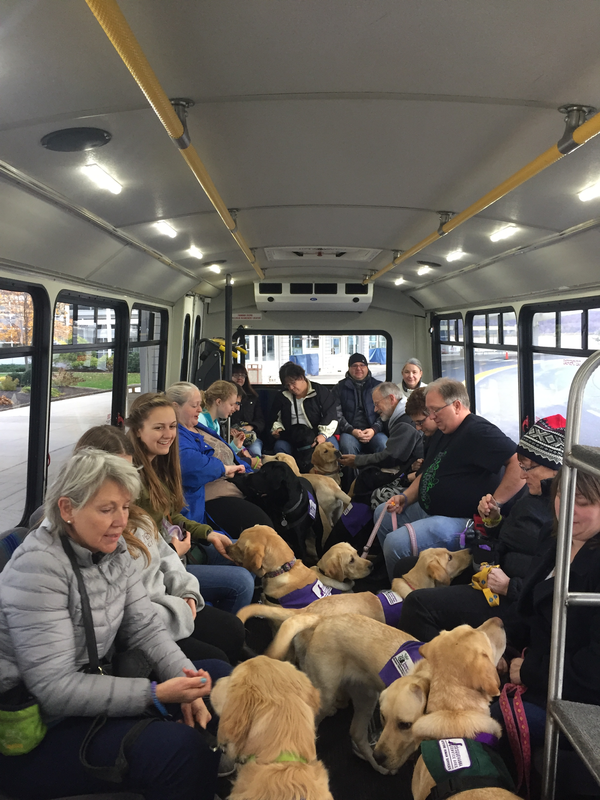 On December 3, we took our puppies in training to HarrisburgInternational Airport for a training outing. 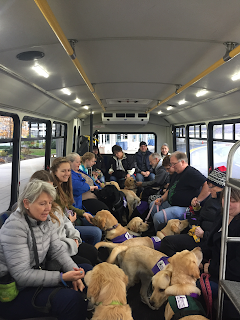 After parking in long-term parking, the dogs and their raisers took the shuttle to the terminal. Once in the terminal, the dogs practiced loose leash walking around the other travelers, as well as taking elevators and stairs. Navigating stairs and elevators are important skills for service dogs. The dogs need to walk right next to their handler on the stairs. The dog should take the stairs one at a time and not charge to the top or bottom. This skill becomes especially important when a service dog is working with a child or someone with mobility issues. If the dog were to charge ahead, they could injure their partner. Elevators are equally important. To correctly enter an elevator, the dog must wait while their handler blocks the doors with their body to prevent the doors from closing and hitting the dog. The handler then cues the dog to “go on through.” Once the dog is complete inside, the handler follows the dog into the elevator. We usually encourage our puppy raisers to move their puppy in training to one of the back corners of the elevator to keep the dog out of the way and reduce the risk of the puppy trying to dash out of the elevator doors when the open. Getting off the elevator is a similar process, with the handler once again blocking the door. Each of our puppies in training had the opportunity to go through airport security and practice getting patted down by a TSA agent. By law, service dogs cannot be separated from their partner, nor can any of their equipment (leash, harness, etc.) be removed. The dogs can be patted down, which can be very exciting for the dogs. Our puppies in training practiced staying focused on their raisers while the TSA agent patted them down. In the past our outings to the airport usually ended after walking through security. But this time, we got to practice boarding a plane! Thanks to American Airlines, our puppies in training learned how to navigate the aisles of the plane and curl up beneath the seat in front of their raisers. This is such an important skill for our puppies to practice because service dogs can travel in the cabin with the partners. However, they are required to ride in small space at their partner’s feet or under the seat in front of them. This can be challenging for a dog who has never done it before. Check out this video from HIA about our adventure! Thank you to Harrisburg International Airport, the TSA agents, and American Airlines for giving our dogs in training this valuable experience! They’ll be ready to fly with their future partners someday! Thank You for Donating on #GivingTuesday! What an incredible day! In 24 hours on #GivingTuesday, you helped us raise $8,963 for vet care for our service dogs in training! Thank you for your generosity! Your donations will go to work almost immediately. Tomorrow, nine puppies are visiting PETS (Pet Emergency Treatment and Specialities) in Lancaster, PA for their CERF eye exams. These eye exams are important for future service dogs. We need to make sure that our dogs are free from heritable eye disease so they can successfully assist their future partners. Thank you for making a difference in the lives of our dogs in training and their future partners! Help us raise $5,000 in one day on #GivingTuesday! Susquehanna Service Dogs is participating in #GivingTuesday, a global day dedicated to giving. All of the money we raise that day will help cover the costs of veterinary care for our service dogs in training. Vet bills are one of our biggest expenses. It costs $100 just for each dog's annual check-up! It's so important for our future service dogs to be healthy. When we place a service dog with their new partner, we want that dog to be able to work and perform the tasks they were trained to do. We would never want to place a dog that would only be able to work a few years. Neither would we want to place a dog that's going to need extensive vet care. Service dogs should make their partner's life easier, not more challenging. That's why we check our dogs' eyes, hips, and elbows, and make sure our dogs get regular vet check-ups. We want our dogs to make a positive difference in their partners' lives. When you donate on #GivingTuesday, you're supporting healthy service dogs who will one day change people's lives. Learn more about our #GivingTuesday efforts and how you can support Susquehanna Service Dogs. 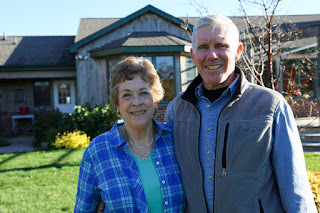 Congratulations to Bill and Susan Tyson! These long-time volunteers recently received Keystone Human Services’ Edna Silberman Humanitarian Award for their volunteer work with Susquehanna Service Dogs! The Edna Silberman Humanitarian Award is given to a person or persons who has made significant contributions to people, the community, and Keystone Human Services, and has played a major role in making Keystone Human Services’ vision real in the lives of others. As you may know, Susquehanna Service Dogs is a program of Keystone Human Services. We’re so pleased that the Tysons were chosen to receive this year’s award! They’ve been volunteering with SSD for over 13 years, ever since Susan answered an ad for puppy raisers and started raising her first puppy, SSD Trout. Since then, she and Bill have been an integral part of our organization. Bill has not only shared his home with many dogs in training over the years, but he has used his skills in building and repairing thing to take care of many of our needs. Just one small example is the ramp he built soon after we moved to our new property. This ramp made it possible so our partners who use wheelchairs could assess our buildings during Team Training. It seems like a small thing, but it made a huge difference. And that’s just one of the things Bill has done for us. Susan has become one of our biggest champions and she’s involved in many different areas of the organization. 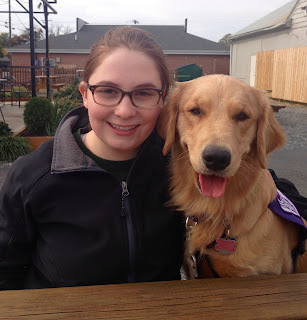 Besides raising multiple puppies for us, she helps to educate people and communities about disabilities and the way service dogs can help people live more independently. She’s extraordinarily generous with her time, talents, and gifts. Thank you, Bill and Susan, for being part of our program and helping to make our mission a reality in people’s lives! It's hard to believe the Girl Scout Puppies turn 10 weeks old this week. 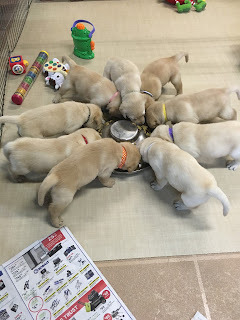 While they have been placed in their newest roles with their puppy raisers and the girls are finishing up their project paperwork, I decided it's my turn to write the last Girl Scout Litter blog entry. My eclectic troop of 8th graders are at the Cadette level, at which point they can opt to work toward the Silver Award, the second highest earned award in Girl Scouting. To earn this award, each girl must identify a problem in the community, come up with a plan on how to solve it, and the work a minimum of 50 service hours toward fixing that problem. The idea is that through this and the next level in Girl Scouting (the Gold Award), the girls can and will change the world. When these girls were in 4th grade, we were working on the Bronze Award (precursor to the Silver), and we were introduced to Susquehanna Service Dogs through puppy hugging. The girls absolutely loved this project and we quickly realized the group had a common love for animals. 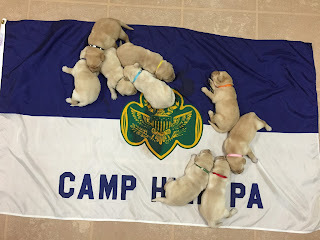 In late spring, one of the girls came to me and asked what I thought of whelping a litter of SSD puppies as a troop Silver Award project. Whelping a litter consists of taking care of the puppies and their mother from the time they're one day old until they're eight weeks old. In addition, the Silver Award project requires that the project be sustainable and that it have an awareness aspect to it. I had to admit, as overwhelming as it seemed, if it could be done it would be an amazing accomplishment. Fast forward to September and we have successfully launched into service SSD Scout, SSD Tagalong, SSD Troop, SSD Archer, SSD Samoa, SSD Gordon, SSD Juliette, SSD Savannah, and SSD Summit. (Yes, the girls chose the names. Yes, they are based on the Girl Scout theme, and no, they are not all cookies.) Through this project, the girls have logged over 1,238 service hours; collected 795 items; created 4 billboards, one iMovie, numerous blog posts and social media entries; and even managed to get our little life changers blessed at church. We have one girl raising one of the puppies and three girls who are now SSD-approved sitters. Wow. Girls, job well done. You have demonstrated a tremendous amount of commitment, responsibility, leadership, creativity, initiative, attention to detail, time management, passion, patience, friendship, love, caring, kindness, thoughtfulness, trust, tirelessness, and perseverance--all with a positive attitude. You have learned many important lessons, including those of life, death, and finishing what you start. Thank you, SSD staff and volunteers, for believing in and supporting these girls. You took a chance on them, and in so doing, provided them with this amazing opportunity to make a difference. It's an experience they (and I) will remember forever. If you are thinking about getting involved with Susquehanna Service Dogs, do it. There are numerous opportunities available, including adopting discharged pups like our SSD Samoa who has an eye issue. Not to worry, he will be placed in a caring home and will make a fantastic pet. To find out more about SSD's work and to continue to follow the journeys of the Girl Scout Puppies, visit Susquehanna Service Dogs' Facebook Page or follow @SSDOGS on Twitter. Greetings from Girl Scout Troop 11967! Last weekend our troop did so many exciting and amazing things! 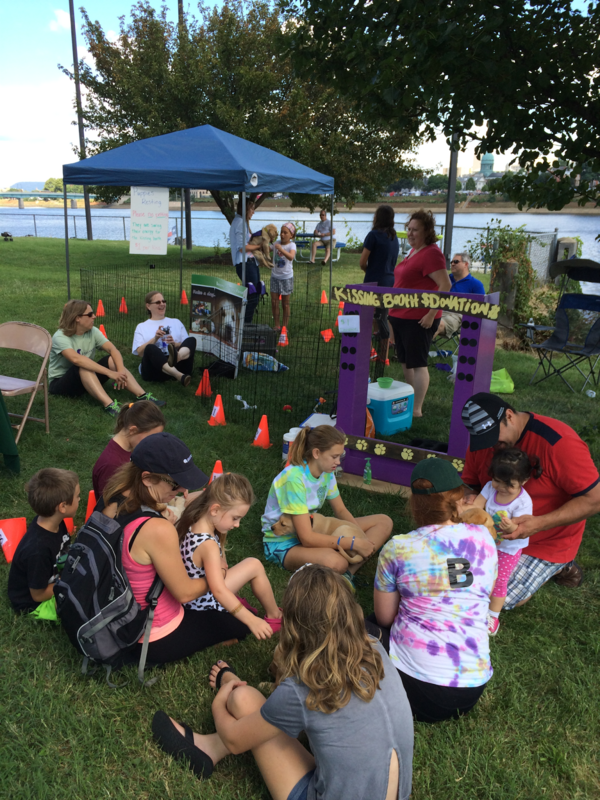 On Saturday, September 3, we went to Kipona in Harrisburg, PA. there we had an SSD kissing booth, which turned out to be a huge hit. 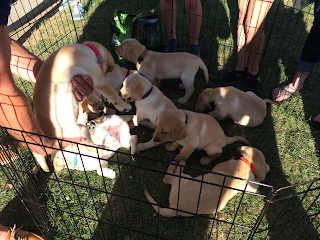 Many people came to see the puppies, including the 7-week-old Summer Olympians Litter. 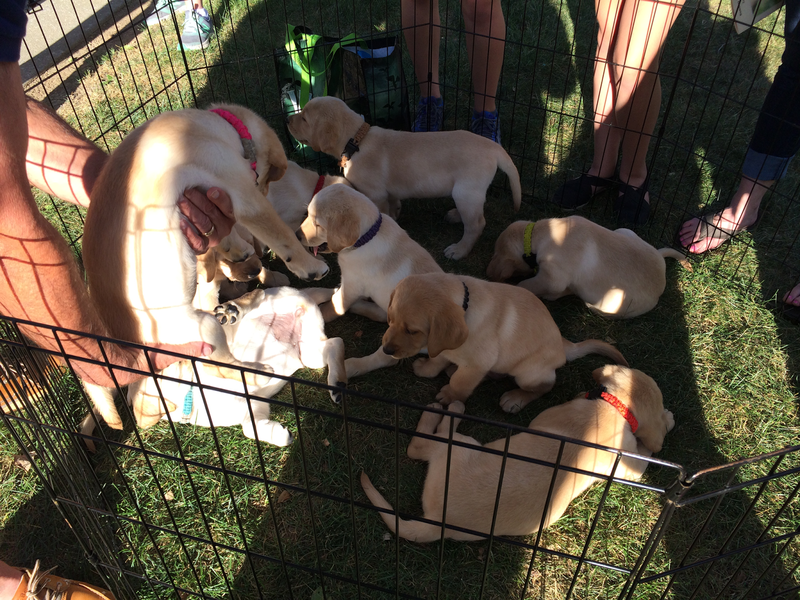 We all had so much fun sharing the puppies with the public and spreading awareness about SSD's puppy raiser program. Later that evening, we had a blessing for the puppies. We took all nine Girl Scout puppies to Grace Lutheran Church in Camp Hill, PA, and each puppy was acknowledged and blessed in the ceremony. The puppies just received their shots, and they are now allowed to go outside and play in the grass. The weather has been very nice lately, so our troop has been taking the dogs outside to play around. We also bring out a little kiddie pool for the puppies to splash around in. The puppies enjoy exploring under the deck where they are covered with shade, and they play with sticks and inner tubes. They also like lying near the house to get shade and water from the hose. Between the dirt under the deck and the water in the pool, the dogs often get very dirty. After we wash each dog and dry them, we take them inside to rest. Going outside is a whole new adventure for the puppies and one they all seem to enjoy, although it is often difficult to control nine puppies playing outside for the first time! It is a great experience for us and them. The puppies are growing so quickly! Their small, pointy teeth have started coming in, so we started feeding them gruel. Gruel is dog food soaked in hot water and then mashed up.The puppies get so excited that they walk all through the food bowl. Also, they play with each other, wrestling and jumping around. Some, like SSD Scout, even play-growl. 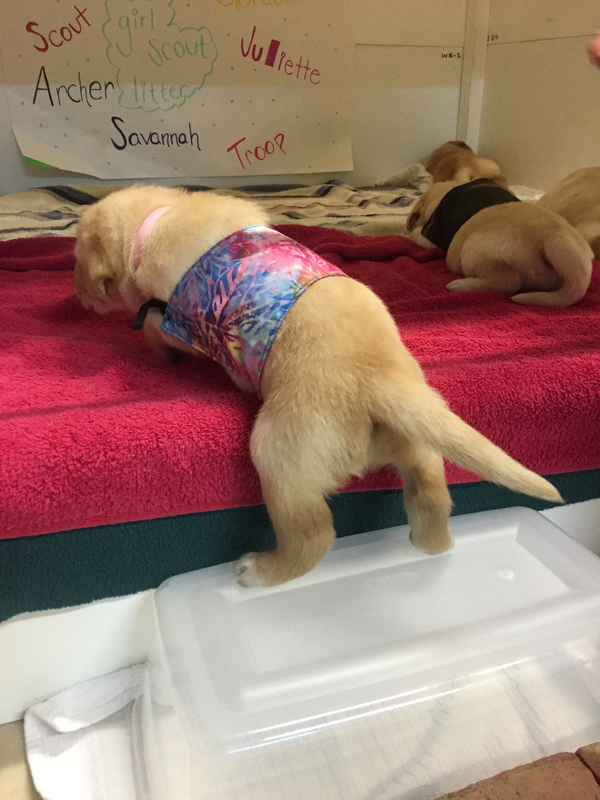 We have to put mini vests on the puppies so they can start learning what they feel like. Another thing we do is hand brightly colored objects from the side of the pen. Their eyes and ears are now fully open, so we have to get them used to bright colors and loud sounds. In most recent days, the puppies have been moved outside to get used to their new surroundings on the patio. In our preparations, we swept the patio to get rid of all the leaves and weeds. Then we had to bleach and scrub the patio with brushes. After the patio cleansing, we set up the pen with a tent overhead for shade and brought out half the puppies. Although they cried and whined, the puppies adjusted to their new surroundings smoothly. 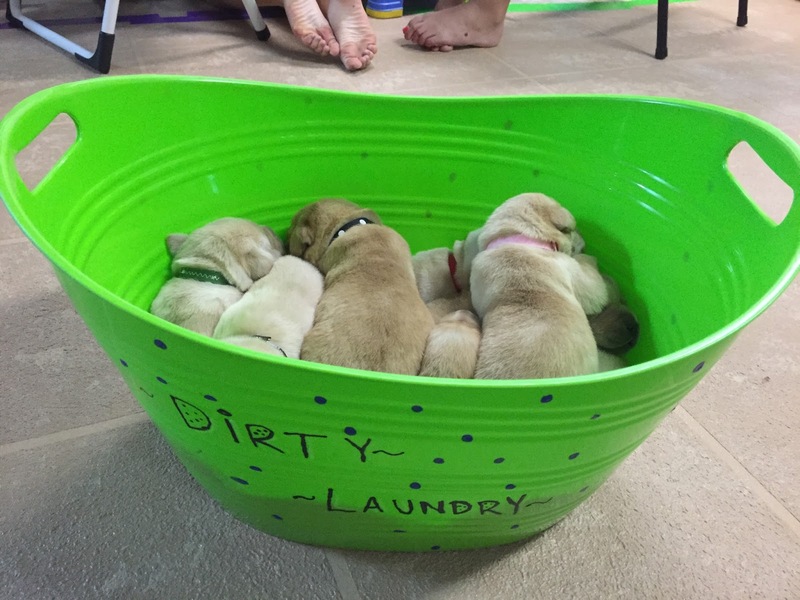 The next day, we bathed and dried each little puppy, only to have them all fall asleep. They're all adjusting to the new surfaces quickly and feeding well. Girl Scout Puppies On the Move! SSD Juliette wears her little harness while she practices going up stairs. The last two mornings with the puppies went very smoothly, and they are doing great. They started to wear their harnesses, and they look adorable in them. the puppies are even learning to climb up and down small stairs, and some of them, like Juliette and Tagalong, did it with almost no help at all! We had to wash the puppies, weigh them, and clean the whelping box, too. SSD Aunt Megan is also doing extremely well and is a very good mom. 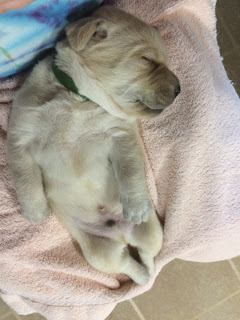 Keep watching the puppy cam for the rest of the many weeks we are whelping them to see how they are doing. Guest post by Girl Scout Troop 11967. Troop 11967 is caring for SSD Aunt Megan and her nine puppies, who will be trained as service dogs. Yesterday was my first time meeting and working with the SSD puppies and their mom, SSD Aunt Megan. When I first got there, I met Megan and bonded with her before I met the puppies, so Megan would trust me. Shortly after, I got to meet the nine puppies and rub and scratch their stomachs and ears. Next is when the real work started. We first started by doing ENS (Early Neurological Stimulation)* by holding the puppies toward us, holding them with their back toward the ground, holding them upside down, and placing them on a cold, wet washcloth. Then we picked them up and tickled their toes with a Q-tip. this process is to stimulate the puppies using different sensations. Then we put all the puppies into a separate bin and we cleaned the whelping by by removing the dirty towels, wiping down the sides and bottom of the box, and putting in fresh towels and toys. After putting the puppies back into the box, I went upstairs to feed mama Megan. Once we returned downstairs, we cleaned the puppy toys using water and bleach. Finally to finish, we mopped the floor. Although all of these tasks are repeated several times a day, I was only there for a small amount of time, and I only got to do each step once. Even though it was hard work, I enjoyed working with the puppies very much. *Early Neurological Stimulation (ENS) helps to create dogs who are better equipped to handle stress, which is extremely important for service dogs, who will be going everywhere with their partner. On Monday, six of our dogs left our program to go work with the CIA. We could not be prouder of Coach, Elsa, Harmony, Oasis, Olive, and Zeus! These dogs were hand-picked by the CIA because of their unique abilities, including their energy, focus, and love of work, and they will go on to do great things with their new handlers. Too often, however, dogs in our program that don’t go on to become service dogs are seen as failures. We say that they are not! These dogs are just as successful as the dogs that become service dogs. Service dog work is just one type of work available for our dogs. True, because we are a service dog organization, our goal is to raise and train dogs to become working service dogs. However, each dog has a unique personality and set of skills that make them best suited to certain types of work. Sometimes that work might be acting as a counter balance for someone. Sometimes it might be alerting to sounds. Sometimes it might be recognizing a person’s anxiety and taking action to calm the person down. And sometimes that work might be recognizing different smells. When they’re done with their training with the CIA, Zeus, Coach, Elsa, Harmony, Olive, and Oasis will be able to sniff out 19,000 explosive scents! Their ability to recognize and alert to these scents will save people’s lives. Pretty incredible! We like to think that each puppy is on a journey, and we never know exactly where their path will take them. They start their journey with their whelping family for the first eight weeks of their lives. Their next and longest step is with their puppy raiser, who welcomes the puppy into their home at eight weeks old. Our raisers are amazing! They spend the next 16-18 months training that puppy, teaching them good house manners and 26 different cues. And everyone wants each dog to become a service dog. The reality, though, is that not every dog is going to become a service dog. Only 50-60% of our dogs become service dogs. But that doesn’t mean the other 40-50% failed or that their raisers didn’t go a good job. It just means that service dog work wasn’t right for that dog and their journey is taking them down a different path. Some dogs, like Coach, Elsa, Harmony, Oasis, Olive, and Zeus, have personalities and skills that will make them awesome CIA dogs. Some dogs, like Heritage, excel with the police. Some dogs join the Bureau of Alcohol, Tobacco, Firearms, and Explosives (ATF), and others join the UN. We hear wonderful things about our dogs that have taken a different path to become working dogs! Sometimes a dog’s skills and personality make them best suited to life as a pet with a loving family. Does that mean the dog failed? Nope. It just means that they are doing what they were meant to do, and their puppy raisers gave them the best start possible. We are proud of our dogs no matter what path they take, and we know that they will make a difference in people’s lives. We’re thankful to our puppy raisers who devote their time and hearts to our dogs! Congratulations to Coach, Elsa, Harmony, Oasis, Olive, Zeus, their puppy raisers, and their new handlers in the CIA! Before you read the guest post, we have some sad news to share. One of Aunt Megan’s puppies, Junior, passed away. Our experienced whelping team was monitoring him closely, but unfortunately, he was unable to thrive. He’s buried in a special place at the home of one of our whelping volunteers. Auntie Megan gave birth to ten adorable puppies! 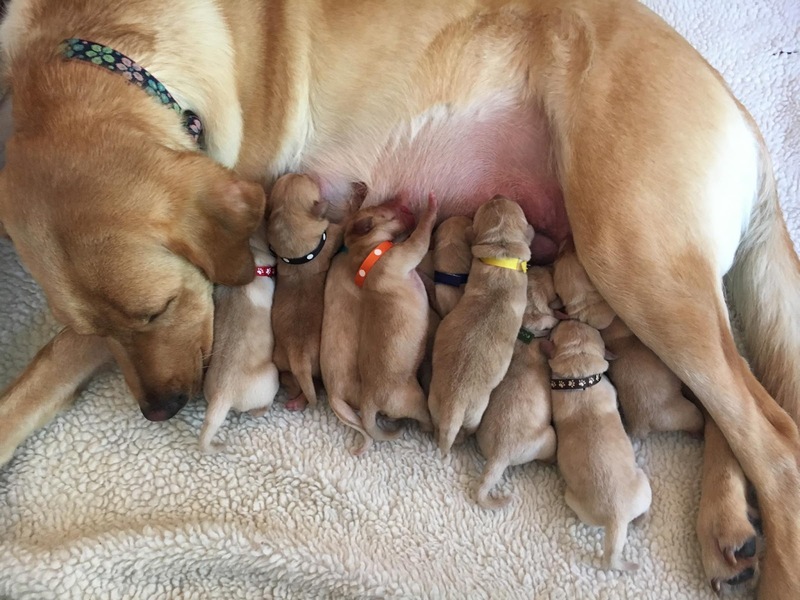 She had seven boys and three girls. Unfortunately one of the boys, Junior, sadly died on July 18. So now there are only nine puppies. The male puppies are Scout, Tagalong (Tag), Troop, Archer, Samoa, and Gordon. The female names are Juliette, Savannah, and Summit. We named the puppies important names corresponding to some of our favorite Girl Scout names for dogs. We chose Scout as a name for the word "Girl Scout." Tagalong, or Tag for short, and Samoa were chosen from some popular Girl Scout Cookies, the Tagalong and Samoa. Troop was chosen from what we call our Girl Scout group. Archer was chosen because one of our favorite sports and badges is archery. The last of the males is Gordon. Gordon is the middle name of Juliette Gordon Low, who was the founder of Girl Scouts of the USA. SSD Juliette was also named after her. Savannah was named after the Girl Scout Cookie, the Savannah Smiles. Savannah, Georgia was also the birthplace of Juliette Gordon Low. Lastly, Summit was named after the pin you receive after you complete all three journeys. We are looking forward to getting to know the puppies and helping Auntie Megan take care of them. Guest post by Girl Scout Troop 11967. The Girl Scouts are whelping SSD Aunt Megan's puppies, known as the Girl Scout Litter. Aunt Megan's puppies were born yesterday! We cleaned the whelping box and its surrounding area. It was quick and easy with four of us working. We took off our shoes, signed the log book, and started working! First, we took out the towels that were in the whelping box and washed them. Then we wiped down the box completely with Clorox wipes. We also wiped the legs of all the chairs nearby, and then we put clean, fresh towels in the whelping box. Once that was done, we mopped and vacuumed the area, including the carpets so Pizzelle's fur wasn't everywhere. [The Troop leader is raising SSD Pizzelle over the summer until she moves to Dickinson Dog House at Dickinson College to finish her training.] Next, we thoroughly mopped the area where the puppies and Aunt Megan would be. It's important that other odors aren't around the area. Soon after, we went outside and tried training Pizzelle, but she was too distracted. In addition, the Girl Scout Litter was born yesterday! We can't wait to start training and raising a group of pups that will help people and the community in a big way! 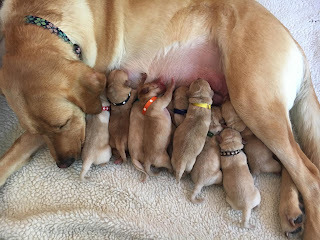 SSD Aunt Megan gave birth to 10 puppies on July 12, 2016. She has seven males and three females, all yellow. We'll announce the names soon! 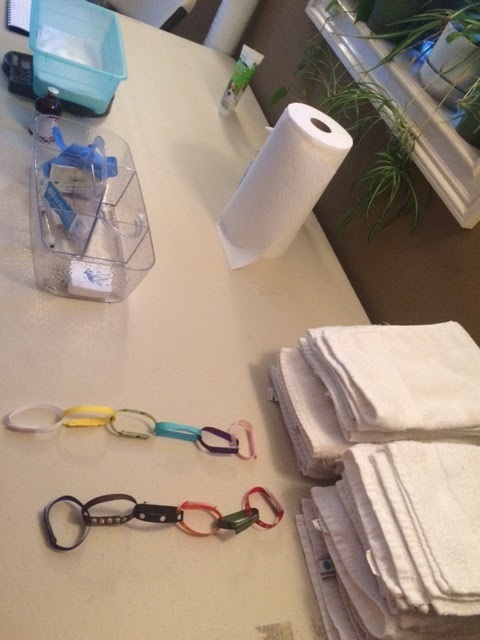 Guest blog post by Girl Scout Troop 11967. The Girl Scouts will be whelping SSD Aunt Megan's upcoming litter of puppies. Her puppies will be known as the Girl Scout Litter. In our most recent Girl Scout meeting, we learned that if we are going to be using the internet and social media to write about the Girl Scout Litter, we need to be careful and safe while using it. Also, we went to visit SSD Aunt Megan! She is so close to giving birth and we are so excited! While we were at Aunt Megan's puppy raiser's house, we learned about the birth process of dogs and what Susquehanna Service Dogs does to prepare for the birth. We saw where the puppies will be born, and we saw their little collars! Aunt Megan's raiser also told us what she would do if the puppies have trouble breathing or are not breathing at all when they are born. SSD Aunt Megan checks out the whelping box, which is where her puppies will live for the first few weeks of their lives. We even got to feel the puppies in Aunt Megan's stomach! We gained so much new information at this meeting and we look forward to whelping the Girl Scout Litter! Introducing the Upcoming Girl Scout Litter! 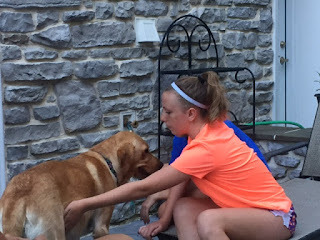 Troop 11967 will be whelping Aunt Megan's puppies and blogging about their experiences. Look for regular posts about Aunt Megan and her pups! Hi! We are Girl Scout Troop 11967 and there are currently 9 girls in our Cadette troop. This summer, we are whelping a litter of puppies for SSD. We're whelping the puppies to earn our Silver Award, which is the second highest award a Girl Scout can receive. Every girl in our troop loves animals, so this is the perfect thing to do this summer for the award. It's a requirement to volunteer 50 hours of service, which will be very easy to get when all these cute puppies are born. The mother dog that we will take care of is SSD Aunt Megan, a yellow lab from the Aunts and Uncles Litter. She was bred with SSD Fiji, who is also yellow and is from the Islands Litter. Aunt Megan just had her x-ray, and she is having 9 or 10 puppies. The vet confirmed that she is having 9, but couldn't tell if there was a tenth one. Then our leader will pick up the puppies and the fun will begin! We cannot wait for the puppies and believe it will be a very fun experience. Make sure to check back for more of our blog entries and follow our litter, the Girl Scout Litter! Three years ago, we decided to sign up to be puppy raisers because we said goodbye to our two family dogs within a year of each other. We never wanted to have to do that again but knew our family was missing a dog. Susquehanna Service Dogs fills the needs of many individuals with disabilities. We have watched individuals with visible disabilities become more independent by having a dog who has helped them navigate their daily routines and to live more independently. We have watched individuals with invisible disabilities have more confidence, companionship, and reassurance in their daily lives. We have had the opportunity in the last three years to raise four dogs, all at different stages in their journey. SSD Ali, Orlando, Annabelle, and Thornwald all filled a need in our lives that make us better puppy raisers and supporters of SSD. SSD Ali is a breeder for SSD and continues to add puppies that will grow to be the next generation of service dogs! Ali is the proud momma of two litters, the Carlisle Litter and the Cheese Litter, who are growing up and will one day fill the needs of individuals with disabilities. Orlando and Thornwald have chosen different paths other than being service dogs--and they have both filled the needs of families who wanted loyal and loving family pets. Annabelle has also chosen a different path, but she has filled our need to love and want our very own pet again. She joined our forever family in October. Susquehanna Service Dogs is about filling needs for all people, and we are truly blessed to be a part of this great organization. Join Shari, Ellen, and Susquehanna Service Dogs for the Highmark Walk for a Healthy Community! SSD is one of 47 organizations participating in the Highmark Walk, and 100% of the money you raise comes directly to SSD! Guest post by Maddie Levy. 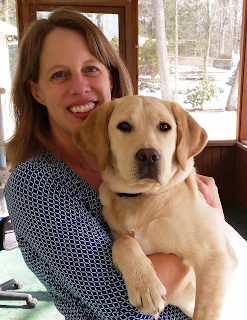 Maddie and her family have been volunteer puppy raisers and sitters for the past four years. For four years, my family and I have opened our home to Susquehanna Service Dogs' puppies in training. During that time, we have raised, trained, and puppy sat future service dogs. Currently, we are raising SSD Truffle, whose mother, SSD Splash, we co-raised with another volunteer. While raising Splash, our goal was obviously for her to become a working service dog. However, SSD had plans for her as a breeder, and she recently had her first litter, the Sweet Treats. Bringing Splash through the program and seeing her have her litter has brought us nothing but joy and love. The moment we took her in, we were impacted by her gentle and affectionate personality. Splash's effect on the people around her is well illustrated by her actions at a doctor's appointment we had brought her to about a year ago. As we were checking out, Splash was sitting next to me. I felt a tug on the leash. When I looked behind me, I saw a baby, maybe a year old, hugging Splash, who was leaning into her, resting her head on the girl's shoulder. The reason I walk for SSD is because I love to watch my dogs make people smile. Seeing the puppies make a difference in my life, my family's life, and even brightening the days of everyone they meet confirms their impact on their future partners, who in a time of need receive the companionship and aid of truly amazing and talented dogs. 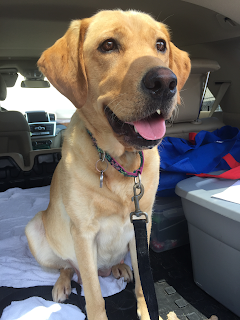 Join Maddie and Susquehanna Service Dogs for the Highmark Walk for a Healthy Community. SSD is one of 47 organizations participating in the Highmark Walk, and because Highmark generously underwrites the cost of the Walk, 100% of the funds you raise come directly to SSD. Sign up as a walker or virtual walker and #WalkforSSD! All of our service dogs in training are crate trained. 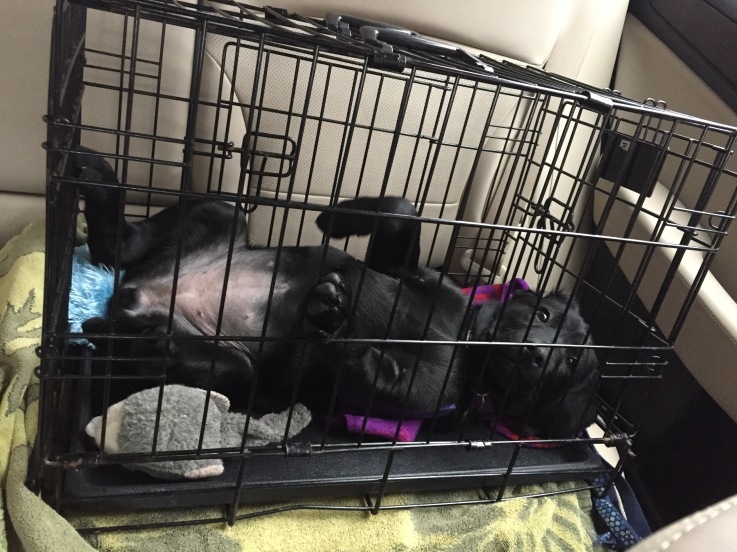 Until they’re 16 weeks old, they ride in a crate in the car. At home or at the office, our puppies spend time in crates. They’ll spend time crated while they’re in advanced training, and they will most likely spend some time in a crate after they’re placed as working service dogs. The goal is for the dog to go into their crate on cue (“kennel”) and then be able to spend at least 8 consecutive hours quietly relaxing inside with the door closed. The dog should be able to relax quietly in their crate overnight, during the day, when they’re alone, and when people are around. There’s a misconception that crate time is a punishment, but that could not be farther from the truth. A dog’s crate is their safe spot. Think of the crate as the dog’s bedroom. It’s a place to relax, where they don’t need to think about working. There are many reasons why crate training is important for service dogs. 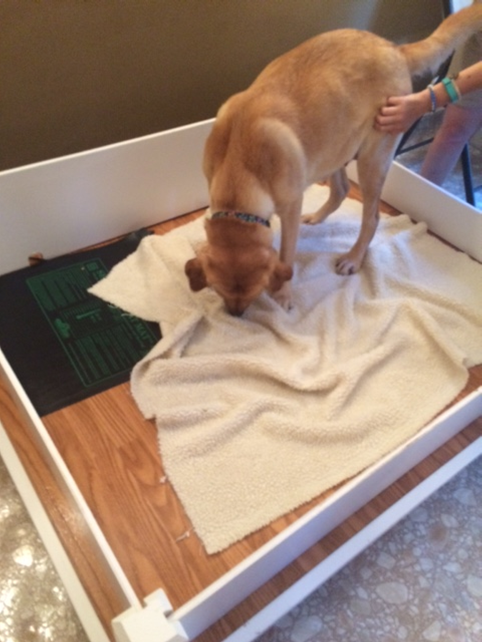 Crates are a way for puppy raisers to manage their dog’s behavior. If the raiser has errands to run and cannot take their puppy with them, crating the dog can prevent that dog from getting into mischief while they’re home alone. For example, crating the dog will prevent them from forming bad house manners, such as hopping on furniture or countersurfing. Our dogs never outgrow crate time. Crate training is actually part of a dog’s good house manners, and dogs that cannot spend time quietly in their crate may be discharged. Dogs spend time in crates during advanced training. When our dogs in training come to the kennel for advanced training, they will be spending time in a crate. We may have anywhere from 15-20 dogs in advanced training at one time. While the dogs spend time working with our trainers and going out in public with our volunteers, they don’t train for the entire day. They need time to relax, and one place where they do that is in the crate. Crates give service dogs a place to relax. We recommend that our partners get a crate for their dog. It gives the dog a place where they know they can relax stress-free. For facility dogs that are supporting many people or children, the crate becomes even more important. Working with an entire classroom of students is very challenging for a service dog. In fact, it takes a special temperament to be able to do this work because it can be very stressful. 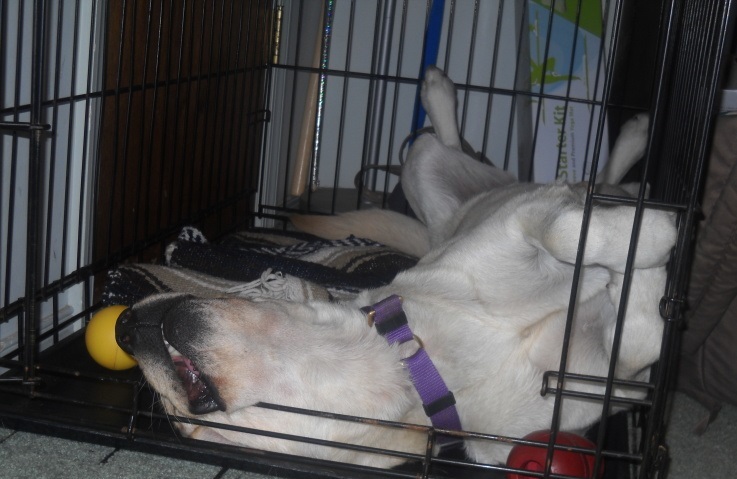 Having a crate—a safe spot—gives facility dogs a stress-free zone to relax, take a nap, or chew on a bone. Crates are a place where service dogs can safely sleep. It’s the partner’s choice whether their service dog is allowed on the bed. Not all of our partners want their service dog to sleep in bed with them. Depending on the person’s disability, it may not be possible for the service dog to sleep in bed. For example, a person may use certain medical equipment at night, or it could be that any movement by the dog on a bed causes the person pain. The crate becomes the perfect place for the dog to sleep, eliminating the possibility that the dog will help themselves to the bed during the night. To help your dog enjoy being in their crate, start by putting the crate in an area where your dog will still be able to see people. You don’t want your dog to be isolated from everyone when they’re in their crate. You can also include a soft blanket and a safe, favorite toy. Introduce your dog to the crate simply by tossing a piece of dog food inside. Let your dog go inside to eat it, but leave the door open. If your dog chooses to stay inside the crate, great! Leave the door open and keep tossing kibble inside every few seconds. If your dog chooses to exit the crate during this exercise, that’s okay, too. Once you’ve introduced the crate, feed your dog a meal inside it at least once a day. Soon, your dog will associate good things (food and mealtime!) with the crate. When your dog is inside the crate, it’s really important NOT to let them out if they whine or bark. If you let them out every time they whine or bark, they’ll learn that making noise is the way to get out of the crate. Only let them out after they’ve been quiet for a little while. This part of crate training can be very challenging for puppy raisers because some dogs can be very determined barkers! But stay strong and wait them out. You, our trainers, and the dog’s future partner will all benefit. Guest blog post by Deb Tack. She and her family are first-time puppy raisers for Susquehanna Service Dogs. They're currently raising SSD Motzi from the Cheese Litter. For years, our kids asked for another dog--a puppy, of course. Consistently and more times than I can count, the answer was "no." But I wouldn't be writing this if there weren't an "Until..."
Until I read of a brave, young local veteran who suffered from post-traumatic stress disorder and trained his own puppy to alleviate his pain from the horrors of war. His story, as told by his mother, inspired me to learn more about raising a service dog through Susquehanna Service Dogs. Yes, our family could have a puppy, as long as we could train and love her and then let her go. Since August, we have been raising SSD Motzi. Each day, I have the privilege of watching her touch the lives of others while changing ours as well. The stories are countless: watching Motzi and her fellow puppies in training bring laughter to high school students grieving the loss of their friends; meeting a first grader who smiled, enthusiastically asked to pet Motzi, and told me all about the "super awesome" service dogs at his school and how he "loves loves loves" them; sitting by the wheelchair of an elderly woman who, with damp eyes, tenderly pet Motzi and told us over and over the names of her dogs and how much she missed them; and meeting the mall employee who shared a beautiful story of how a Susquehanna Service Dog helped her sister regain her long-lost independence. At home, Motzi gets to be a regular puppy. You can't help but smile when she plops herself on your lap with a huge groan and a sigh after a long day. She makes us laugh when she sees something new and tilts her head to ask, "What's that?" And she knows just when to cuddle up and let you pet your worries away. As any puppy raiser will surely tell you, the question asked most often is "How will you give her up?" My reply, "I think about that every day, and it will be sad; but I've always known she was leaving, and I can't wait to see what she becomes." On-site registration starts at 7:45 a.m.
One Mile Fun Walk begins at 9:15 a.m.
Not all the dogs in our program become service dogs. Although every dog starts on the same path, only 50-60% of them become working service dogs. Being a service dog is challenging. A dog must be able to “turn on” and perform tasks, but then “turn off” and relax when they’re not needed. They must be able to handle the stress of working in public. And most of all, they must enjoy service dog work. What happens to our dogs who don’t become service dogs? Sometimes our dogs show us that service dog work is not for them. This can happen at any point in a dog’s training. What happens to the dogs who don’t make it through our program? Just because a dog doesn’t become a service dog doesn’t mean the dog failed. And it certainly doesn’t mean that the puppy raiser failed. Quite the opposite, actually. Many of the dogs that “don’t make it” simply change careers and continue changing lives. That was the case for Autumn, Delilah, Diesel, and Dory. These four dogs were recently accepted into the CIA’s training program. And just this past December, former SSD dogs Aunt Nancy and Thor graduated as CIA dogs! We’ve also placed dogs with the United Nations; the Bureau of Alcohol, Tobacco, Firearms, and Explosives (ATF); and the state police. The dogs at Hill Top Academy are changing students’ lives, and in at least one instance, saved a student’s life. These dogs are doing the work that best suits them and it’s making a difference. Even if one of our dogs simply becomes a family pet, that doesn’t mean the dog or raiser failed. It just means that the dog found the right path for them, and their raiser helped them get there. While each dog’s journey may start out the same, where they end up varies, and it’s thanks to our puppy raisers that these dogs grow up to change lives. The Importance of a Good "Leave It"
The snow from the massive snow storm is starting to melt, but it can still be slippery out there. Floors and stairs inside can also become slick from snow that gets tracked inside on your shoes. While you’re out with your puppy in training during this time of year, one cue can mean the difference between staying on your feet and falling to the ground. Instead of lunging down the stairs and possibly taking Kelly down with him, Elwood continued to walk calmly by her side. When they reached the step with the treat, he waiting while Kelly picked it up. No one fell down the stairs. No one got hurt. And Elwood got a jackpot of treats to reinforce his excellent behavior! All of our puppies in training start learning “leave it” soon after they join their puppy raisers. It’s one of the more difficult behaviors for a dog to learn and needs to be reinforced constantly. We start training “leave it” by holding a piece of dog food in a closed hand in front of the puppy. We click and treat when the puppy ignores the closed hand and makes eye contact with their raiser. Once the puppy is consistently doing this behavior, we make it harder by holding the food in an open hand, again clicking and treating when the puppy ignores the food. We continue to make the behavior harder by putting the food in different places, such as on the floor, on a coffee table, or on a chair. We use different types of food and objects. The dogs practice walking past food on the floor, table, etc., both on and off leash. And then we work on ignoring food that falls to the ground in front of them. We also train our dogs not to lunge after treats that fall out of their mouth. Dropped treats are lost treats. This is especially important for when the dog is working with their partner. We don’t want the dog to injure their partner because they were chasing after a treat. Do you have a “leave it” story about your service dog or dog in training? Feel free to share it in the comments! Sign Up for the Highmark Walk for a Healthy Community! 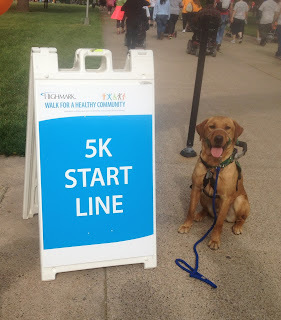 Susquehanna Service Dogs is participating in the Highmark Walk for a Healthy Community again! Last year, you helped us raise over $30,000! This year, we’re raising the bar and setting a goal of $32,000. We know that with your help, we’ll reach it! Thanks to Highmark Blue Shield, which underwrites the entire cost of the Walk, 100% of the money you raise comes to SSD! Sign up for the Walk, raise money, and walk with us on May 21. Sign up as a virtual walker and raise money. This is a great way to participate if you can’t attend the actual Walk on May 21. We hope you’ll join us this year and #WalkforSSD!